For dinosaurs, dinosaur-related, and other prehistoric tropes and Useful Notes. Despite the name, this index also covers non-dinosaurian prehistoric life. See also Avian Tropes, for the dinosaurs' descendants. All Cavemen Were Neanderthals: Cavemen tend to be portrayed as knuckle-dragging, slow-witted brutes clad in skins and carrying clubs. All Flyers Are Birds: Pterosaurs (and sometimes other flying animals like bats) are often given bird-like characteristics, regardless of whether they are birds or not. 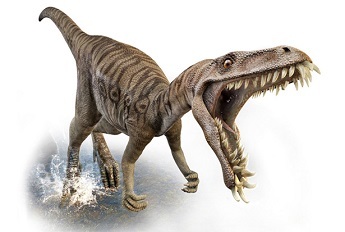 Artistic License  Paleontology: Unrealistic or inaccurate depictions of prehistoric life. Can be extremely Serious Business for some. Dinosaur Doggie Bone: Gigantic, fossilized bones make excellent dog toys! Dinosaur Media: Index of media focusing on dinosaurs and prehistoric life. Dinosaurs Are Dragons: Dinosaurs and dragons tend to be treated as the same thing or to borrow traits from one another. The Dinosaurs Had It Coming: The dinosaurs brought their extinction on themselves. Domesticated Dinosaurs: Dinosaurs kept as domesticated animals for various purposes. Dumb Dinos: Dinosaurs are often portrayed as very stupid, slow, and overly aggressive. Everything's Better with Dinosaurs: Dinosaurs are cool, therefore they make anything they're in more awesome. Feathered Fiend: Just because something is covered in fluffy feathers (whether it's a giant bird or a non-avian theropod), it can still be terrifying! Fossil Revival: Fossilized creatures being brought back to life. Frazetta Man: Prehistoric "humans" portrayed as vicious, stupid, hairy and generally little more than somewhat upright apes. Handsome Heroic Caveman: Prehistoric cavemen with Nubile Savage appearance that usually are The Hero in their stories. Living Dinosaurs: Surviving non-avian dinosaurs found living somewhere remote. Lost World: A hidden, often secret location where people and creatures long gone from the outside word still survive. Mammoths Mean Ice Age: Mammoths are the most common "face" or symbol of the Ice Age, and their presence is often used as a shorthand for it and associated concepts. Medieval Prehistory: Prehistoric life in a vaguely medieval setting. Megalodon: A massive prehistoric shark, believed to have been similar to the modern great white. 1 Million B.C. : Generalized prehistoric setting melding together creatures from wildly different time periods, chiefly dinosaurs, cavemen and mammoths. Phlebotinum Killed the Dinosaurs: Ascribing the extinction of non-avian dinosaurs to a variety of eclectic causes. Prehistoria: Video game levels themed around dinosaurs and prehistory. Prehistoric Monster: Prehistoric creatures were scarier than modern animals. Ptero Soarer: Unrealistic or inaccurate portrayals of pterosaurs. Can be Serious Business for some. Raptor Attack: Unrealistic or inaccurate portrayals of dromeosaurid dinosaurs. Very Serious Business for some. Slurpasaur: Real-life lizards with fake horns or fins glued on used as stand-ins for dinosaurs in old movies. Stock Dinosaurs: The most frequently featured species in media. Tyrannosaurus rex: The iconic "king of dinosaurs", featured in media more often than any other species.